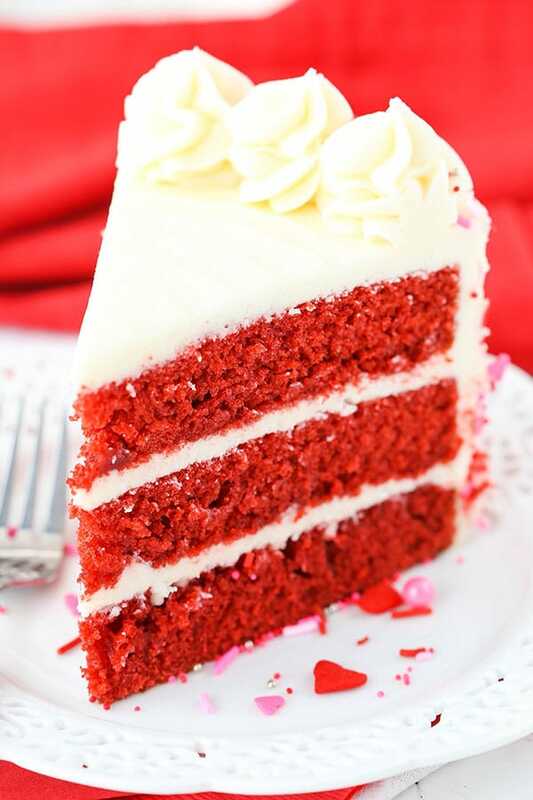 The Red Velvet Layer Cake – it’s a classic! This version is super moist with just the right amount of tang! Plus, it’s easy to make! I wanted to devour the whole cake on my own! If you haven’t seen her shop yet, Sweetapolita opened an online sprinkle shop last year and it’s full of some of the best sprinkle mixes out there. So many colors, occasions and types of sprinkles. 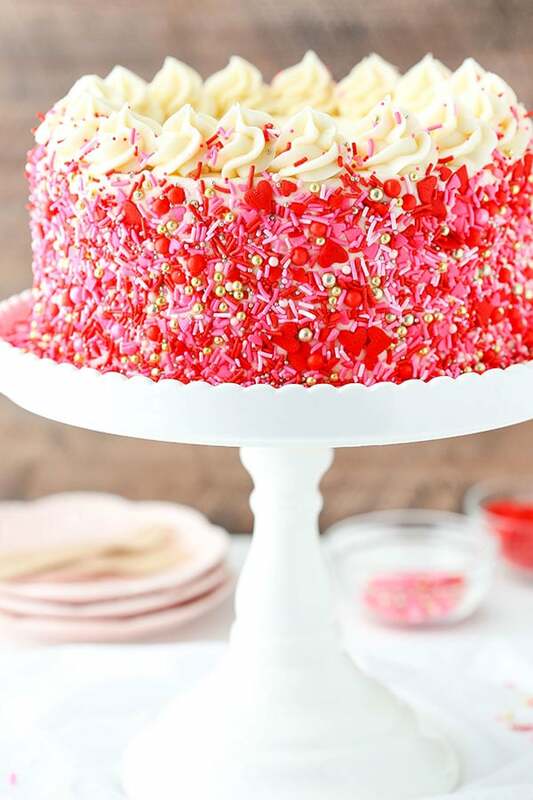 It’s a sprinkle lover’s dream and so is this cake. 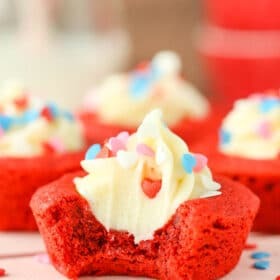 After sharing some Red Velvet Cheesecake Cookie Cups with you last week, I have one more red velvet dessert to share for Valentine’s Day. 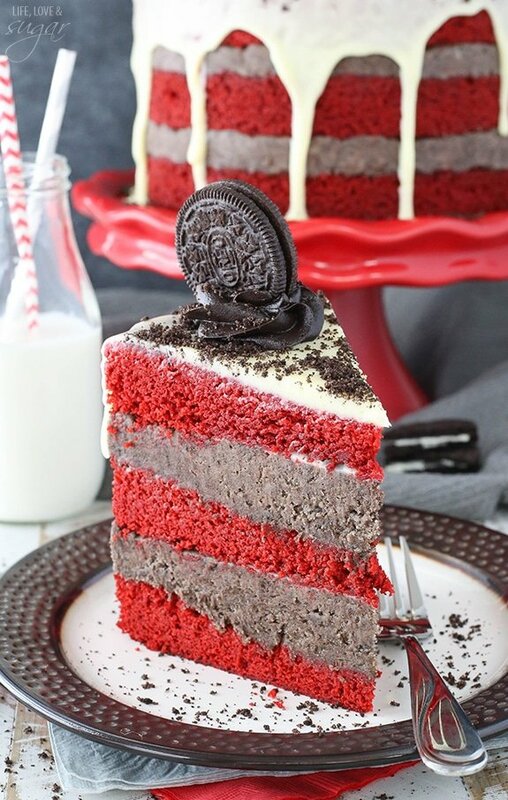 This one is the classic layered cake! And it’s covered in my new favorite sprinkles! This Red Velvet Cake is based off of the Moist Vanilla Cupcakes I shared with you a couple weeks ago. I’m a huge fan of how simple the recipe is! It’s so easy to put together and makes a moist cake that’s also wonderfully fluffy. I knew it’d make a great red velvet too. I swapped a few things around to get the perfect red velvet flavor. First, buttermilk is a must. Red velvet is full of tang and buttermilk is part of the crew of ingredients enlisted to bring the tang. The vinegar also contributes to the tang, in addition to adding to the leavening (rise) of the cake. 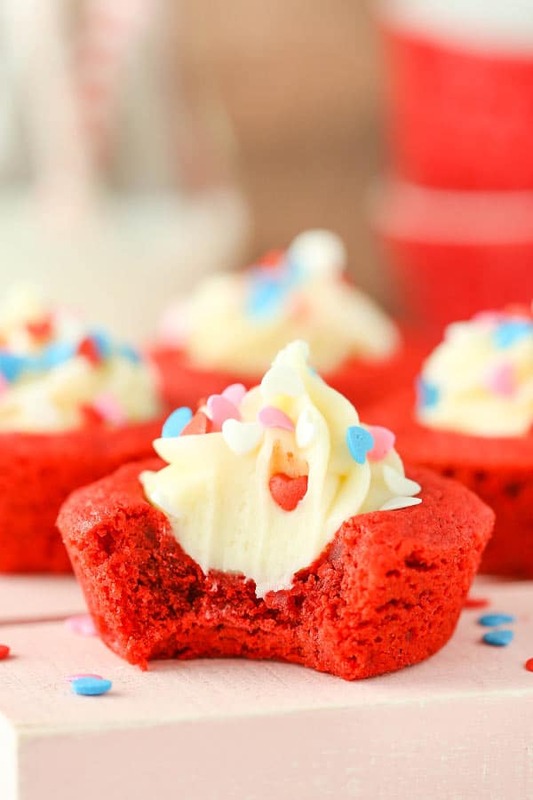 Two other signature parts of red velvet are a touch of cocoa and it’s red color. Covering the cake is the classic cream cheese frosting. Together they make the perfect pair! 1. Preheat oven to 350°F (176°C) and prepare three 8 inch pans with parchment paper in the bottom and spray the sides with non-stick spray. 2. Add the flour, sugar, baking soda, baking powder, cocoa and salt to a large mixer bowl and combine. Set aside. 6. Divide the batter evenly between the three pans and bake for 23-25 minutes, or until a toothpick comes out with a few moist crumbs. 7. Remove the cakes from the oven and allow to cool for 3-5 minutes, then remove to a cooling rack to finish cooling. 8. To make the frosting, combine the cream cheese and butter in a large mixer bowl and mix until smooth. 10. Add the vanilla extract and mix until smooth. 12. When the cakes are cool, build the cake. Remove the domes from the tops of the cake layers with a large serrated knife. 13. 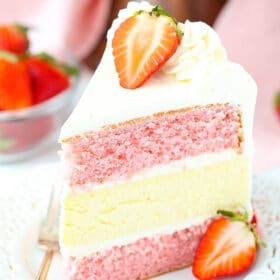 Place the first layer of cake on a cake circle or serving stand, then spread about 1 cup of frosting on top in an even layer. 14. Repeat with the next layer of cake and frosting, then top the cake with the final layer of cake. 15. Frost the outside of the cake. I used my offset spatula to get a nice, even layer. This cream cheese frosting is stickier than some other frostings. Keep aside about 1/2 – 3/4 cup of frosting for the top border. 16. 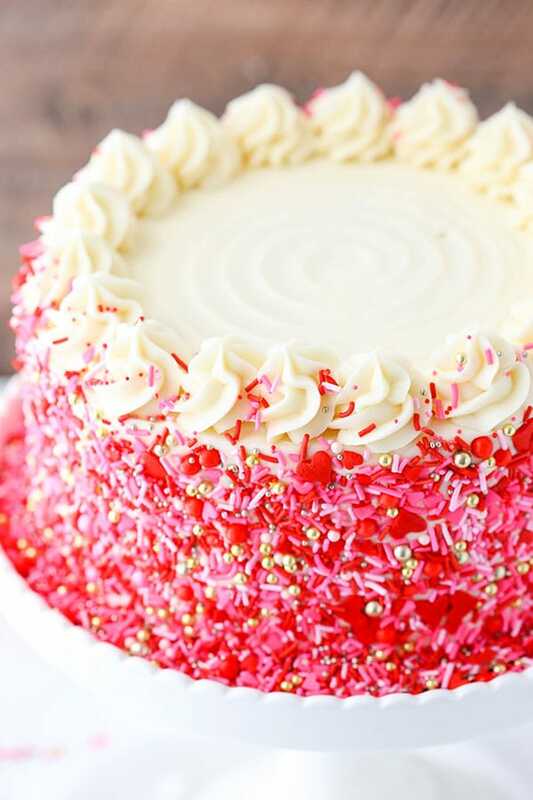 Press the sprinkles onto the sides of the cake. 17. Pipe a border around the top edge of the cake. I used Ateco tip 844, but Wilton 2D or 1M would work as well. 18. Refrigerate cake until ready to serve. Absolutely beautiful!!! I just ordered some of her sprinkles and I’ve definitely been inspired! Hi Lyndsay, what a fabulous looking cake and perfect for my daughter’s 6th birthday coming up! I was wondering quantity wise, how much sprinkles you had to use to cover the side of the cake. I’ve been online to Sweetapolita and just wondering if I can get away with the medium bottle (200g) or do I need to buy the large (400g)! 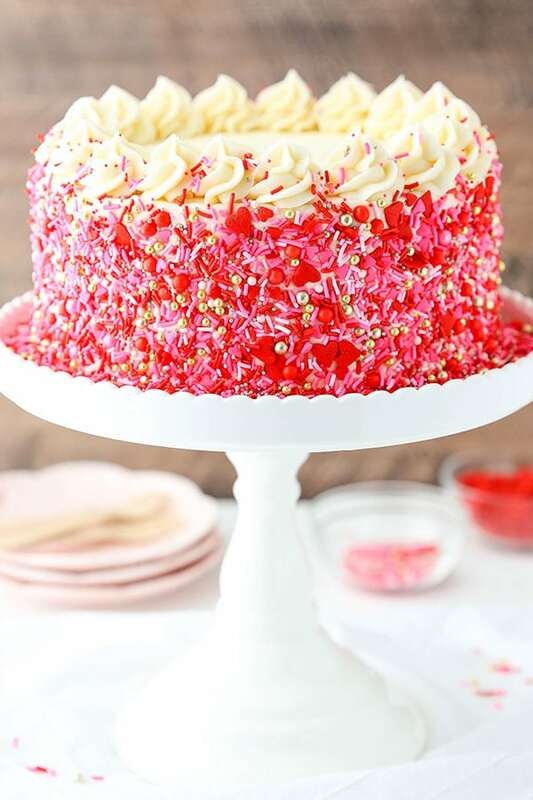 Can you let me know the name of the sprinkles you used too – trying to work it out from pictures but I don’t see the identical one on sweetapolita’s website 🙂 Also any tips on putting the sprinkles around the side of the cake?!? Many thanks, Lorna. What a gorgeous cake! Thanks for all the red velvet goodness! It is my very favorite and perfect for Valentine’s Day! Thanks Vanessa! It should be fine as cupcakes without changes. I hope you enjoy them! 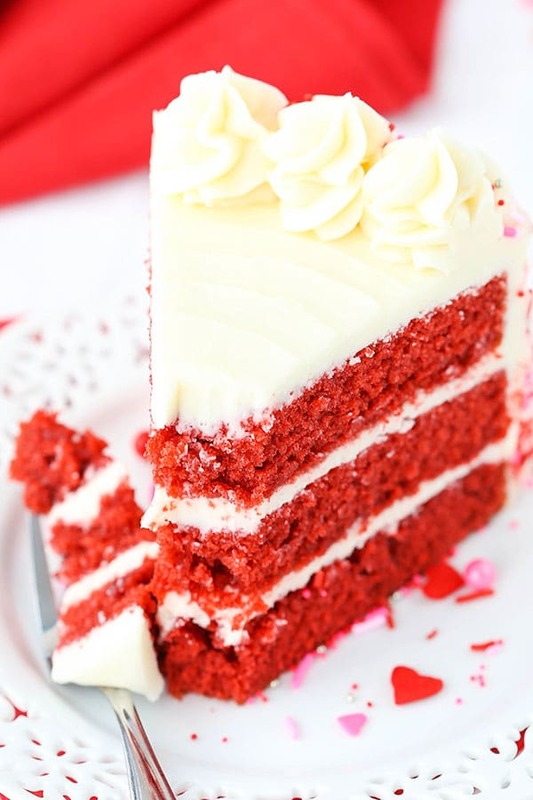 Love this cake but I can never get this colour Red…any suggestions on what you use??? I use McCormick red food coloring. How do u press the sprinkles around the cake so perfectly? Any tricks? How many sprinkles? 1c?? 2? There are some photos in this post that show I usually add sprinkles to the sides. For how many, I used most of a 7oz bottle, so probably one to 1 1/2 cups. I look soooo forward to getting Lindsay’s emails. LOVE them all. WONDERFUL Photos!!! Hello Lindsay! I was thinking about making this recipe into cupcakes or using a 13×9 in cake pan. Do you have any cooking time suggestions? Thank you for all the great recipes! I made cupcakes to compare to my usual recipe and this recipe won hands down!! It s so moist and so flavorful! Thank you! Lindsay, oh my goodness. This cake. It was so good. The texture was so spot on and the flavor was incredible. I never understood the rave over red velvet before, but I think I do now. Thank you for the wonderful recipe! I wanted to make a blue velvet cake. I’ve read things about alterations that need to be made so that it doesn’t come out looking like teal. Any suggestions on how I can work this recipe? It definitely can turn a funny shade. It’s been years since I made a blue velvet cake but I can’t remember what I did. I think I had to try out a few different shades of blue. Hi! This will be the 4th of your recipes that I’ve tried and I love them all!! I was wondering what you think about swapping the buttermilk for the sour cream? So glad you’ve enjoyed them! Not sure about the substitution – it’d probably bake fine, but I do love the tang from buttermilk in red velvet. Hmm, that’s strange you had that outcome. I made this cake and it turned out amazing. Maybe you missed a step or ingredient. I have made at least 50 recipes from this blog and never had a bad outcome. I would recommend trying this again because it’s delicious! Hi! I made this cake today and used a 9×3 cake pan. I timed it for 25 min but felt it should come out at 22min. The top was still “sticky” but the inside clean. Should I keep it in there longer? I was trying to get that moist cake without it drying out. The best way to test I think is with a toothpick. Stick it in the center of the cake and as long as what’s sticking to it is moist crumbs and not liquid and batter-like, it should be fine. This was a really good cake! I made it for my mom for her birthday and it was so good. So good you could eat it by it self. I wish I could show a picture of the cake. As soon as they were done baking, and cooled and the tops were cut off we (my mom and I) ate it. So good. Add the cream cheese frosting and it’s amazing! This is the best red velevet cake I have ever had! And I was never a fan of red velvet before I found a good recipe. I want to try this as cupcakes. How long should I leave it in the oven? 18-20 minutes I think would be good to start with. I have also made your red velvet sandwich cookies. They are so good! Wonderful! So glad to hear that Sarah! 🙂 Thank you! 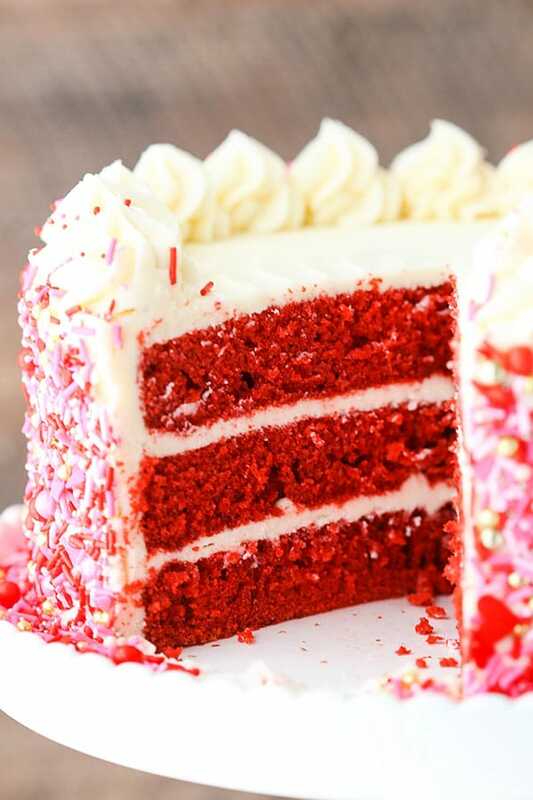 I make wedding cakes, birthday cakes etc here in South Africa, and I always struggled to find the ‘perfect’ red velvet recipe, until I tried this one! It is perfect! Moist, tasty and stable but still soft. Thank you for sharing! Yes, you can certainly use gel coloring. I’m not sure exactly how much. You’d want to add a bit at a time and use your judgement. Can you use powdered buttermilk? I tried this recipe and followed it to a “t”. My cakes were about 1″ high. I have all fresh rising ingredients so that’s not the issue. NEver have had that happen before. Are you sure you fulling creamed the butter and sugar? I’ve often seen people not cream them properly and they don’t get the proper rise and the cakes end up kind of dense. Hi Lindsay! I am making this for my Grandmother’s birthday on Saturday, and reading the above comment confused me. You said that she may not have creamed the butter and sugar properly, but there isn’t any butter listed in the cake ingredients, only oil. I really want this to come out well. Can you clarify for me? Thanks a million! Well that is my mistake. I’m used to most of my cakes having butter and sugar creamed at the beginning. I honestly don’t know why she had that result – the cake seems fairly straight forward and I obviously didn’t have a bad result or I wouldn’t have shared the recipe. It can be very hard to say why someone gets a bad result without being there to physically see what happened. It could be any number of things. I had the same result. Followed every step exactly. The batter was too liquidy once the water is mixed in and cakes didn’t rise. I’m guessing need to beat it for longer to get air ino the batter and thicken it. Some time indicators or texture info at step 4 & 5 would help understand what to expect for amateur bakers like me. What a fantastic cake! 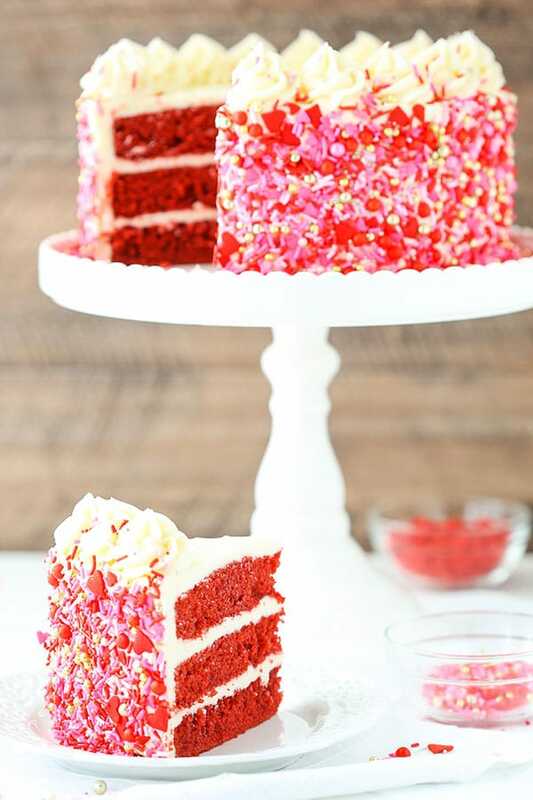 i think this cake is absolutely perfect for Valentine’s Day! Thank you very much for sharing! Hi Lindsay! is it safe to use cake flour instead of all-purpose flour for this recipe? Thank you. I haven’t ever tried it, but my guess would be no. I used to put cake flour in my recipe and turns good..don’t worry ’bout that..
I’m going to make this for Thanksgiving dessert. 🙂 Should I use butter that is salted or unsalted? I have never used hot water in the batter. Whats the point? It is a pretty thin batter so unless your springform pan is super well sealed, it probably would leak. A regular cake pan would be better. Hi Laura! There’s a link to the sprinkles in the recipe. They are from Sweetopolita. 🙂 I usually use McCormick brand food coloring. Hi I’m wanting to make this cake for my partner for Valentine’s day. Could I swap out the white vinegar for Apple cider vinegar instead? Hi, love all your recipes!! Just wondering with the red velvet cake, swapping red food colouring for pink should be okay shouldn’t it? 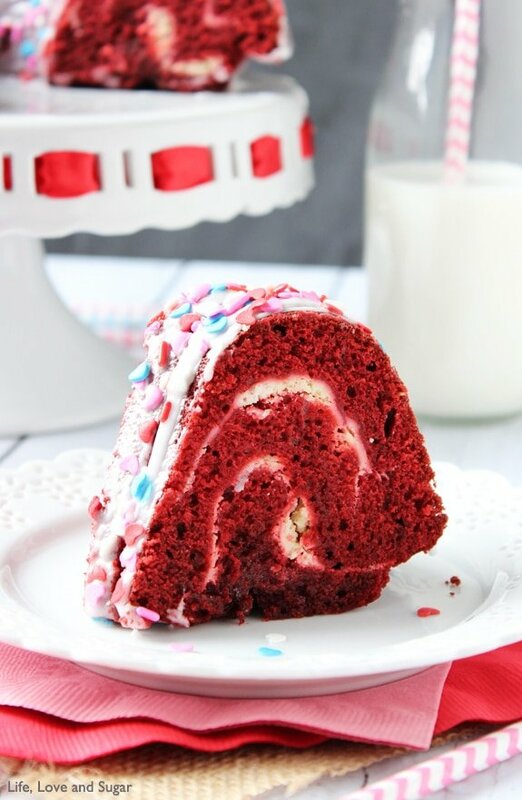 I’ve got gender reveal cake to do and hoping I can use this recipe! I’m so glad you enjoy the recipes! If you are going to make this pink, you’ll want to leave out the cocoa. Hi, Lindsay! I’m about to do this but in our country, there’s only limited store that sells buttermilk. So I won’t be able to use them. Can i replace it with regular milk instead? Will there be any changes if I do this? I think it should be fine with regular milk. 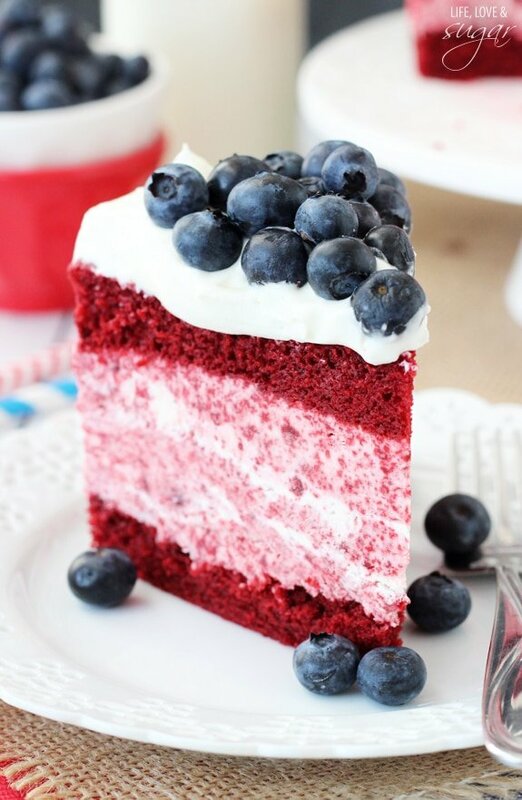 This is the best red velvet recipe out here… can’t stress enough on how moist these cakes are… I’m now obsessed with your recipes as this is the 5th recipe I’m using from your site… thank you… wish I could send you pics.. Awesome! I’m so glad to hear you’re enjoying them! 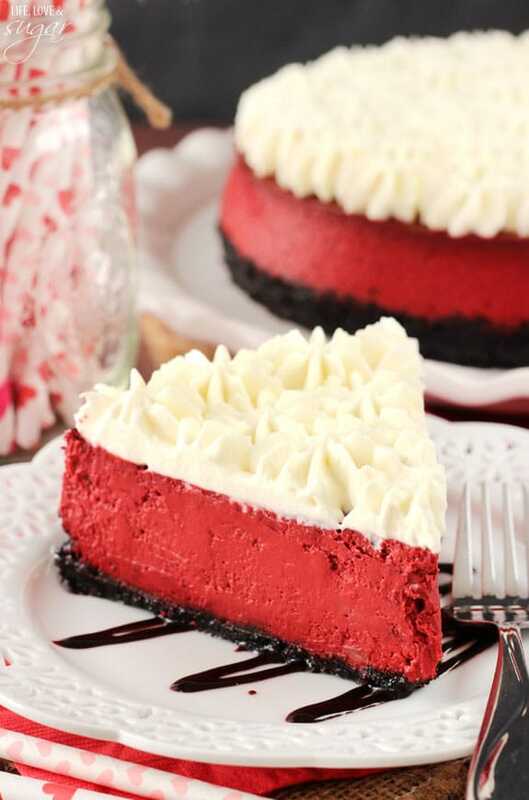 Hi, I want to make this for my friend’s birthday this Friday, do you have any tips on making cream cheese frosting? I’ve tried it before and it came out too runny and would not set! Cream cheese frosting can be tricky. The butter and cream cheese make it fairly thin, so to end up with a thicker consistency, you’ll need to make sure to add enough powdered sugar to thicken it. For my recipe, the amount of powdered sugar listed in the recipe is really going to be best. I know some people like to reduce it, but for it to be thicker, it’s going to be best. HI, I was wondering how baking times would change if a 6 inch pan was used? Thanks! I haven’t used 6 inch pans, so I’m not sure. I’m sorry! 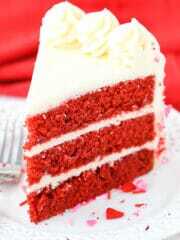 I have made so many red velvet cakes on my quest to find the “perfect” one and this is it!!!! It is a no fail, super moist, always perfect recipe!!!. I am so glad I discovered it. So glad to hear that! Thanks Alicia!